Conversations InterGender - Second Language ability in Intragender and Intergender conversations - video, transcripts and statistical analysis. Each conversation is accompanied by an analysis to give a quick evaluative summation of the students’ performance along with a recommendation of how the students could do better. Various patterns of fluency and dysfluency might be cited if the issue is relevant to the video / transcript. 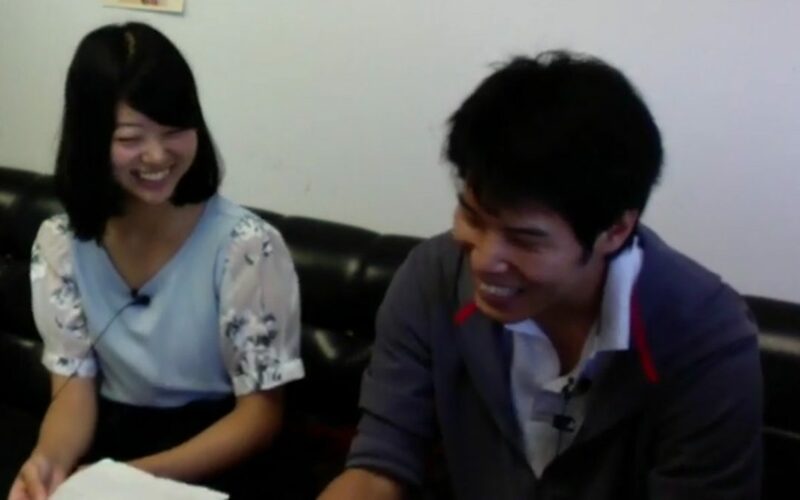 This engaging discussion between Shunichiro and Yuika shows the problem of minimal responses: while Shunichiro has a MLR of 10.0, Yuika’s is only 4.0. But in looking over the transcript, one can see that it is rare for both participants to express more than one sentence…. This discussion between Shunichiro and Yumi represents a more balanced discussion in which both participants contribute almost an equal amount of information although, again, the females provide fewer number of words than the males: with 177 words from Yumi to Shunichiro’s 285. The speaking rate for both participants is almost the same and is fairly average for this level of proficiency 86.3/88.8; acoustic dysfluency is rather high, 14.7%% silence with Shunichiro having 49.3 seconds of silence compared to Yumi’s 19, though cross-talk pausing is minimal. Lexical dysfluency is only notable due to the use of L1 and to some mispronounced word on the part of Shunichiro. Syntactic dsyfluency is a bit high insofar that MLRs are short with there being lots of repetition and meaningless syllables on the part of Shunichiro. As with the other transcripts, minimal responses are too common and both participants could make the interaction far more interesting by providing more insights, stories, opinions, and examples. This gendered discussion is interesting insofar that both participants really seemed to enjoy talking, so the percentage of silence is low, around 3.5%. Cross-talk pausing is not evident. There was a high rate of speaking rate for Shohei 122.7 as compared to Megumi’s, which was somewhat low 58.9. One issue that is apparent from the transcript is the very high level of minimal responses, so longer replies could help to improve the overall fluency of both participants. This discussion is rather fluid, with low cross-talk pausing 4.3 seconds, with a total amount of silence being 32.5 seconds. Lexical dysfluency is very limited to just some L1 usage, though syntactic dysfluency is high on one variable, repetition (Megumi: 25 occurrences). MLRs are fairly the same length for both participants, 8.1 for Kohei and 10.5 for Megumi. Kohei’s speaking rate is relatively high 101.0 but Megumi’s could be much higher 57.7 There are some minimal responses.